Hydrosols: The Tipping Point is Safety! I purchased my first hydrosol in 1989, a lovely gallon of Rosa damascena from the May 1989 Turkish harvest. The well-known aromatherapist must have given direction on storage and use, but I don’t recall them. I still have some of that hydrosol, archived for decades in a refrigerator, brought out now and then to sniff, or transfer a bit to a sterile sprayer for use on the tips of my hair. No sign of microbial growth, the main problem with hydrosols, but I am aware that sometimes the growth does not show up as dark swirls or gunk on the bottom of the bottle, it can be invisible. For readers who aren’t familiar with what hydrosols are, they’re the water from distillation, and they contain water-soluble aromatics of the plant. Many now distill just for hydrosol, which is a slightly different process from distilling for essential oils, wherein hydrosols are a “byproduct” of the essential oil process. I often make “stovetop” distillations which don’t require a distillation unit, and pop them into sterile bottles and into the fridge, with an expected shelf life of a week or so. Care must be taken to avoid allowing microbes into the hydrosol, as it is easily contaminated by your fingers, microbes in the air and such. 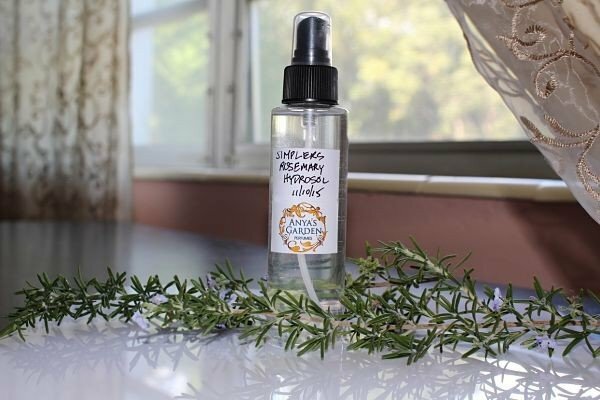 Refreshing rosemary simplers’ hydrosol made with fresh rosemary from my garden. Note the bottle and cap from the UV sterilization unit. 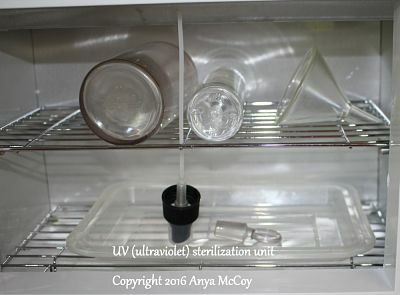 Quick and easy way to sterilize materials with UV light. Over the years, I’ve purchased organic hydrosols that I resold, and they were microbe-free. I purchased two hydrosols for personal use, one from a very well-known herbal supplier, and the orange blossom hydrosol quickly went bad. I knew it wasn’t my having a hand in contaminating it, as it had a spray top. When I wrote them, they said they had distilled it themselves from *dried*! orange blossoms, and didn’t know about needing sterile bottles. Mind you, this is a huge company, but I guess nobody did their research. Another bad hydrosol came from a friend who was in the essential oil supply business, but who didn’t know anything about hydrosols. It went bad very quickly. In 2009, I distilled for the first time, in a glass still, and got a few milliliters of exquisite bay leaf essential oil, and some lovely hydrosol. Well, I wasn’t stringent about sterile bottles, and the hydrosol went bad, even under refrigeration. I should have known better, but the distillation was haphazard, as we were both learning, and scrambling around. I never made that mistake again! Here’s my problem in 2017. Everybody is loving hydrosols and jumping on the hydrosol-making trend. Too many folks, in my opinion, although they may have taken a course with a great distiller, don’t understand all the need for sterilization of equipment, and good labeling. A few months ago, a local friend received a gift of a hydrosol made from grapes at an herbal conference. She called me when the bottle developed an obvious microbial contamination, full of dark swirls. I was shocked, and told her to toss it. What made this so urgent in my mind is the fact she has an illness that requires her to have zero immune system. Yes, she must surpress her immune system to live. No eating at buffets, no digging in the soil, no public transportation, just a very carefully-controlled environment to prevent anything from attacking her because it can KILL her. The person who gave her the hydrosol is known to me to be very sloppy and incompetent when it comes to safety, from making body butters that can cause citrus phototoxicity and permanent scarring, to not sterilizing her bottles for hydrosols. Ugh. I had warned her many times about her careless use of essential oils, hydrosols and such, but here was an event that could cause death. I propose that not only do makers of hydrosols get highly educated on how to sterilize, store, and distribute these beautiful fragrant waters, but that they adopt a labeling standard that can help keep the waters safe(r). Warning to those with compromised immune systems or other health concern to not use them. Instructions to not open the cap and leave the hydrosol exposed to air. Instructions to no touch the neck of the bottle so that their finger comes in contact with the hydrosol. Do not breath into the hydrosol, it may distribute microbes from your respiratory system into the hydrosol. At the sign of anything “growing” inside, discard the hydrosol. Dear reader, can you think of anything else. Please help me correct any errors and spread the word about safety and hydrosols. This entry was posted in Hydrosols, raw materials of perfumery on November 2, 2017 by Anya. I’ve added the rarest of the rare oils – Golden Boronia absolute from Tasmania – to the Flash Year-End Sale. I’m one of the few retail sources for this uplifting floral oil, and I love to share it at an affordable price to perfumers and perfume lovers. This price will not be repeated for a year, so stock up now. Use the code boronia at checkout. Syrupy, unctuous and utterly delicious – boronia! Included in this flash sale: nine-year old vintage sandalwood, wildcrafted from Sri Lanka. This smells as delicious as Mysore White sandalwood of legend. 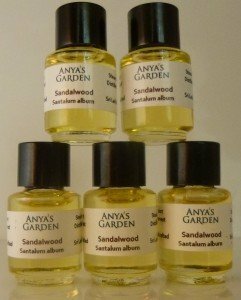 Vintage, wildcrafted sandalwood oil from Sri Lanka – rich, buttery, woody Available in 5ml (shown) or 15ml sizes. Image of former 4ml vanilla abs – now available in 5ml and 15ml sizes! And finally: Madagascar is known for its fine vanilla, and this absolute is a ten-year-old vintage, aged like fine wine, made from organic (non-certified) vanilla beans and organic sugar cane alcohol. Great for food or perfumery. Available in 5ml or 15ml sizes. Happy New Year and Best Wishes from Anya’s Garden! 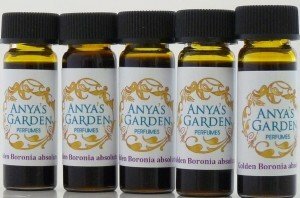 This entry was posted in Anya's Garden Perfumes, natural aromatics, raw materials of perfumery on December 30, 2015 by Anya.